Between 1763 and 1768, about 200 years before the advent of GPS, Charles Mason and Jeremiah Dixon marked the 233 mile long boundary line between Pennsylvania and Maryland and the 83 mile long boundary between Maryland and Delaware; this was the Mason-Dixon Line. When cartographers such as Samuel De Champlain and James Cook plotted the coastlines of North America in the fifteenth and sixteenth centuries respectively, they would have used instruments such as the astrolabe and the sextant to measure the altitudes of celestial bodies in relation to the horizon. Such instruments would have been of little use to Mason and Dixon amongst the forests and hills of Delaware and Pennsylvania where the horizon would not be visible so, instead of measuring the altitudes of celestial bodies, they used a device called a ‘zenith sector’ to measure the zenith distance, that is the angle between their zenith and the celestial body. In the diagram below, B is the position of an observer on the Earth’s surface and Z is the observer’s zenith. X is the position of a celestial body and U is the geographical position of the body on the Earth’s surface. BH is the visible horizon from B. 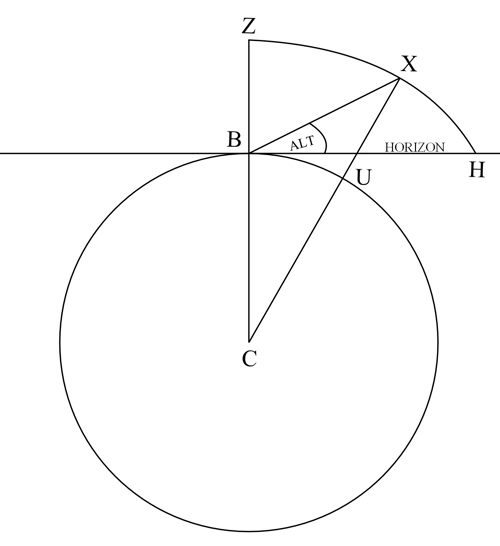 Angle XBH is the altitude and angle XBZ is the zenith distance (90o – altitude). Firstly, whereas the sextant is a hand-held instrument which is used from the pitching deck of a ship, the zenith sector is a fixed instrument which is placed on solid ground. Secondly, whereas a sextant with a vernier scale allows you to measure angles to an accuracy of 0.1 minutes of arc, it is possible to achieve an accuracy of 0.1 seconds of arc with a zenith sector. Thirdly, refraction is at a minimum when a celestial body nears its zenith and so the accuracy of the zenith sector which measures the angle between the observer’s zenith and the body when it is at its zenith, will be less affected by refraction. On the other hand, when a sextant is used to measure the altitude of bodies closer to the horizon where refraction is greatest, a correction has to be made. Fourthly, a sextant is used to measure the angle between the body and the horizon. 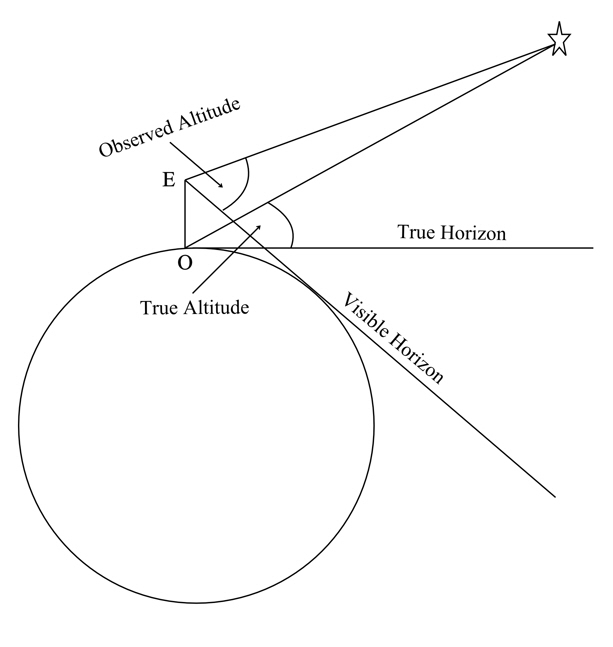 As shown in the diagram below, the observer measures the altitude in relation to the visible horizon from his position at O on the Earth’s surface. So, the observed altitude is the angle HOX. However, the true altitude is measured from the Earth’s centre in relation to the celestial horizon and is the angle RCX. Point O will be approximately 6367 Km. from the centre of the Earth and so it would seem that the visible horizon is bound to be slightly offset from the celestial horizon. Because of the vast distances of the stars and the planets from the Earth, we can assume that, in their cases, the celestial horizon and the visible horizon correspond with very little error. However, in the cases of the Sun and the Moon, which are relatively near, a correction called Parallax must be added. In the diagram, O is an observer’s position on the Earth’s surface and E is the position of his eye. We can see that, as the observer’s height of eye is raised above sea level, his visible horizon ‘dips’ below the true horizon and so the altitude measured at E becomes greater than that measured at O.
Dip is the error caused by this difference and has to be subtracted from the reading. The method used by Mason and Dixon to calculate latitude. To an observer on the Earth’s surface, a celestial body will rise in the east, ascend until it reaches its zenith and then descend until it sets in the west. When the body reaches its zenith in relation to the observer, it will be over the observer’s meridian of longitude. If, at that moment, the observer were to measure the angular distance from his zenith to the celestial body, he will have measured its zenith distance. Since the body is over the observer’s meridian, its bearing will be either north or south (unless of course it is overhead). The Declination of a celestial body can be summarised as the celestial equivalent of Latitude since it is the angular distance of a celestial body North or South of the Celestial Equator. Say, for example, we calculate that a star’s zenith distance is 5o 15’ while its bearing is due south, we can conclude that our latitude is 5o 15’ north of the star’s declination. If the declination of the star is 39o 30’ North, then our latitude must be 39o 30’ + 5o 15’, that is 44o 45’ north. This in essence is the method used by Mason and Dixon when using a zenith sector to calculate latitude. The reason that they chose to use stars for their observations is that the declinations of the stars change very slowly and can be considered to be almost constant for up to a month at a time. The declinations of the Sun, the Moon and the planets change rapidly in comparison with the stars and to use these celestial bodies would have made their calculations more complicated. Calculating latitude from the altititude of the Sun. If you wish to learn about the method used at sea to find your latitude from the altitude of the Sun at midday, click here. Zenith. The point on the celestial sphere directly above the observer is called the Zenith. The term zenith is also used to refer to the highest point reached by a celestial body during its apparent orbit around a given point of observation. The altitude is the angle between the celestial horizon and the direction of the celestial body. 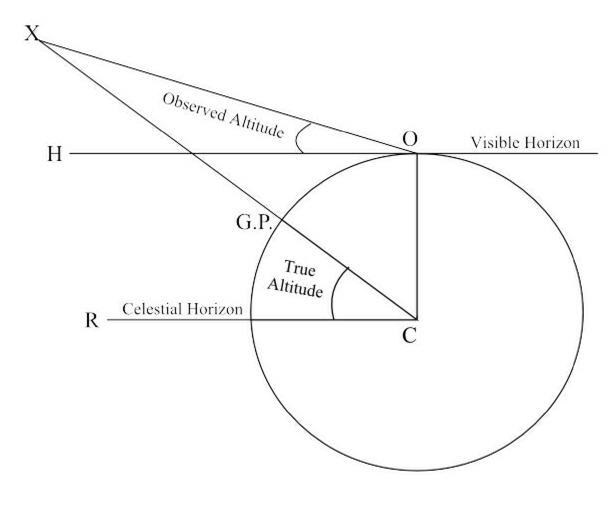 The celestial horizon is the projection of the observer’s horizon onto the celestial sphere. The zenith distance is the angle between the direction of the celestial body and the observer’s zenith. Declination. The Declination of a celestial body is its angular distance North or South of the Celestial Equator. This entry was posted in astro navigation and tagged astro navigation, astronomy, celestial navigation, Mason Dixon Line, navigation. Bookmark the permalink.